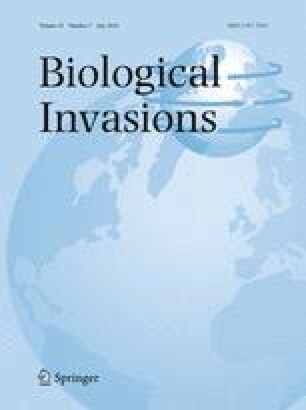 Disturbance may play a key role in affecting animal invasions; less appreciated is that past and present disturbances might interact to affect invasion. For example, although large portions of forest ecosystems worldwide are jointly affected by a history of past agricultural land use as well as contemporary timber harvest, it is unclear whether these disturbances facilitate biological invasions. We conducted a large-scale experiment that coupled adjacent non-agricultural and post-agricultural sites and a factorial canopy-thinning manipulation to understand how past agricultural land use might interact with contemporary canopy thinning to affect the distribution (i.e., presence/absence of mounds) and abundance of a highly invasive ant species, Solenopsis invicta, and common native ant species, Dorymyrmex bureni. Mounds of S. invicta were more likely to be present in unthinned post-agricultural habitats than unthinned non-agricultural habitats, but this legacy effect disappeared with canopy thinning. In unthinned habitats, the presence of D. bureni mounds did not differ based on past land use. However, presence of D. bureni mounds was greater in thinned non-agricultural habitats than thinned post-agricultural habitats. Once present in an area, mound abundance was largely related to temperature near the ground for both species, and negatively related to soil compaction for D. bureni. Our results provide large-scale evidence that an understanding of anthropogenic events that occur decades before present may be essential for interpreting contemporary invasion dynamics and the distribution of some species, and that local contemporary habitat characteristics play a key role in determining ant abundance once an area is colonized. The online version of this article (doi: 10.1007/s10530-016-1122-5) contains supplementary material, which is available to authorized users. This study was made possible by J. Blake, E. Olsen, K. Wright, and other members of the USDA Forest Service Savannah River, who were instrumental in the construction of the experimental landscape and provided ongoing logistical support. We thank D. Fegan for assistance with plot establishment, J. Ledvina and L. Brudvig for advice on research design, and P. Hahn for advice on statistical analyses. This manuscript was improved by comments from M. Turner, J. Pauli, and members of the Orrock Lab. Funding and support was provided by the USDA Forest Service, Savannah River, under Interagency Agreement DE-AI09-00SR22188, the UW Vilas Associates Fellowship (to JLO), and the Strategic Environmental Research and Development Program (Project RC-1695).